Cleaning is always a chore and sometimes a workout! 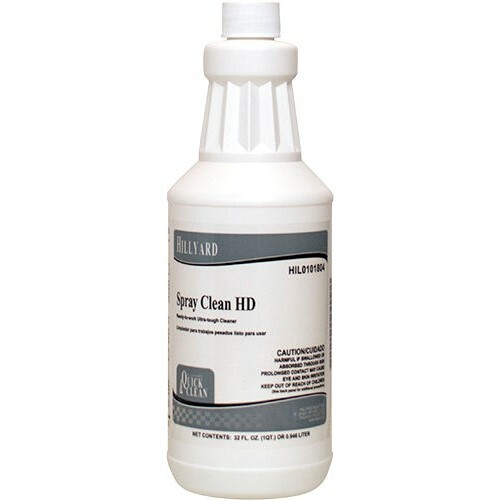 Hillyard has made it easier with Spray Clean HD. This is the most aggressive ready to use spray and wipe cleaner that Hillyard makes. Let Spray Clean HD do the work for you to eliminate the toughest dirt, grease, and grime. This means less scrubbing and less of a workout when cleaning. But wait??? it also removes a variety of stubborn stains and marks such as fingerprints, rubber marks, lipstick, pencil, crayon, hair and body oils, grease, shoe polish, smoke film, and many others. If you are looking for an aggressive easy to use cleaner, this is the product for you! Do not use on or near uncured paint, this will cause discoloration. Do not use on aluminum or copper! Sometimes cleaning requires a little extra scrubbing - you know a little extra elbow grease...Not when you clean with this! Work smarter not harder is what you get when you clean with this. Awesome product!